Jasper One Sock, is a beautiful rose grey suri out of a bay black dam, TSP's Peruvian Ashley and a light fawn show winning sire, FSA Baron's Peruvian Stratosphere with Accoyo bloodlines. Jasper One Sock has 2 crias in the Suri Sensational Sale: Beth My CupCake and Gypsey Rose. She is the daughter of bay black Zenith's Peruvian Maverik and OUF Wild Flower, a true black. Wild Ebony Rose is a combination of several generations of breeding for black using Chilean and Bolivian import black bloodlines. 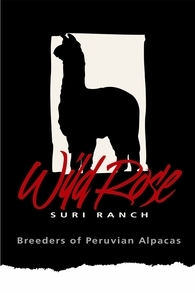 In addition, her bloodlines also include Accoyo Miguel who launched the multi-champion black breeding program for Great Lakes Alpacas with his true black son, Shavano. Gypsey is a dark silver grey female with a splash of white flash on her face, chest, and front feet. Her lineage is stacked with dark color, especially black: Renzo, Bailey, Breakstone Dune's Asia, Diamond's Black Sapphire, QA11 Black Diamond, and TSP's Peruvian Ashley. Her bloodlines are a mix of Chilean, Bolivian, Peruvian, and Accoyo to take the best traits and intense colors to produce her. Gypsey Rose has a uniform grey blanket - no spots of white other than her distinct flashy markings, no brown spots, etc. She has good conformation, a strong rear profile, good bite, and pleasing proportions. She sheared a 3 lb 8 oz blanket in 2015 at the age of 2.75 years, her 2nd shearing, and she has wonderful fineness with a sorting grade of 4, with her primaries and secondaries only 1 grade apart. Wild Ebony Rose is Gypsey's dam, ad she is the daughter of bay black Zenith's Peruvian Maverik and OUF Wild Flower, a true black. Wild Ebony Rose is a combination of several generations of breeding for black using Chilean and Bolivian import black bloodlines. 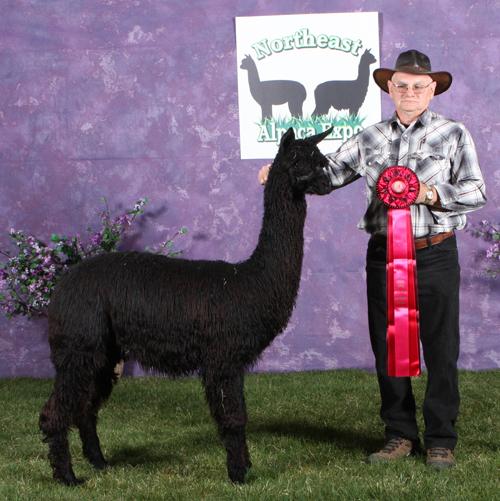 In addition, her bloodlines also include Accoyo Miguel who launched the multi-champion black breeding program for Great Lakes Alpacas with his true black son, Shavano. 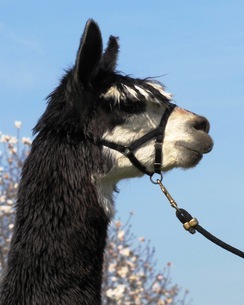 Gypsey's sire, Jasper One Sock, is a beautiful rose grey suri out of a bay black dam, TSP's Peruvian Ashley and a light fawn show winning sire, FSA Baron's Peruvian Stratosphere with Accoyo bloodlines. Jasper One Sock has 2 crias in the Suri Sensational Sale: Beth My CupCake and Gypsey Rose. She was bred to Shasta Springs Fusion and delivered a high luster, solid brown female cria, WRSR Tootsie Pop by Fusion, on 7/28/16. Tootsie Pop has beautiful uniform lock structure and is very fine. Her color is a uniform and solid deep light brown, plus she has a pleasing friendly personality. Gypsey has a tremendous amount of milk, with Tootsie weighing more than 60 lbs at 3 months of age! She is a great mom and milk producer. 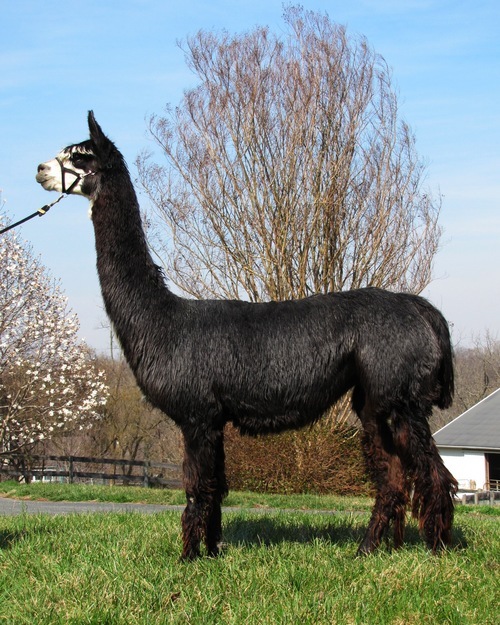 Gypsey Rose was bred to Fox Run's Peruvian Nomar, a deep purple-maroon Macgyver son by a black dam. 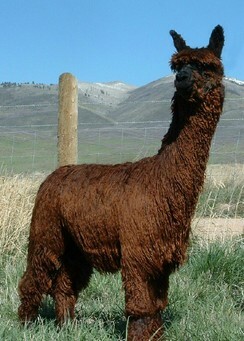 Nomar has produced 100% color crias, and usually dark ones. 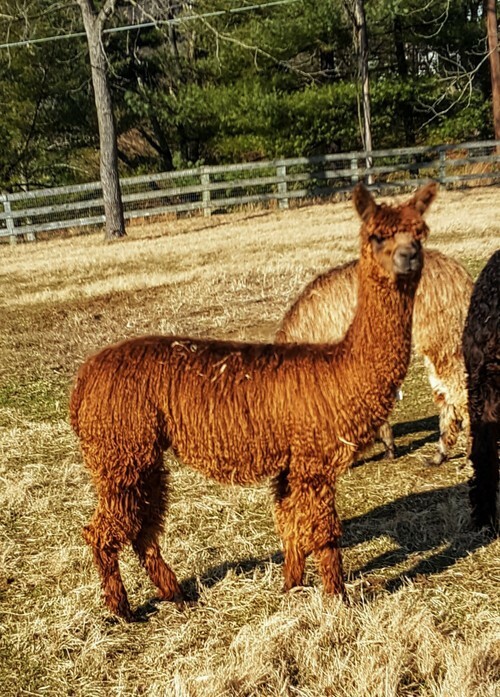 In April 2018, she delivered a beautiful deep maroon FEMALE, WRSR Eclipse by Nomar, who looks just like her, except in maroon. Eclipse has been very fast growing, as Gypsey delivers easily and milks like a dairy cow. Once again, Eclipse was over 60 lbs at 3 months of age. Eclipse is offered for sale...check our her listing. 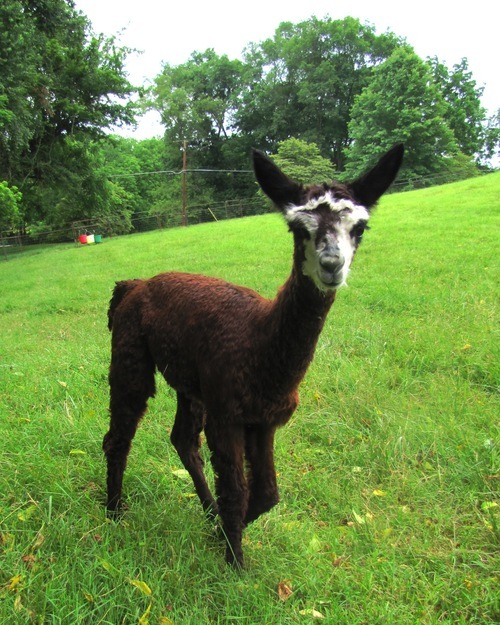 This cria is available for sale at a discounted price with her dam before she is weaned. Contact Patti for more information at 443-740-4240. Special Offer for non-auction purchases: Purchase with a cash payment and receive FREE TRANSPORT (up to $300) to your farm.